The development of novel molecular imaging agents and therapeutics; focus on synthetic chemistry. Current projects include imaging acute inflammation-related neutrophil activation and migration with PET, SPECT and live animal fluorescence modalities with small peptide ligand and developing tumor-targeting molecules as cancer imaging agent and drug carrier. Synthesis of PECAM-1-specific 64Cu PET imaging agent: evaluation of myocardial infarction caused by ischemia-reperfusion injury in mouse. 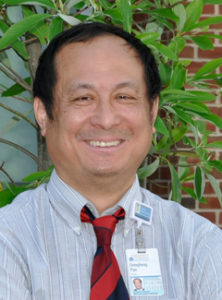 Xiao L, Zhang Y, Yang Z, Xu Y, Kundu B, Chordia MD, Pan D. Bioorg Med Chem Lett. 2012 Jun 15;22(12):4144-7. Epub 2012 Apr 21. A novel near-infrared fluorescence imaging probe for in vivo neutrophil tracking. Xiao L, Zhang Y, Berr SS, Chordia MD, Pramoonjago P, Pu L, Pan D. Mol Imaging. 2011;11(5):1-11. Neutrophil targeting heterobivalent SPECT imaging probe: cFLFLF-PEG-TKPPR-99mTc.Zhang Y, Xiao L, Chordia MD, Locke LW, Williams MB, Berr SS, Pan D. Bioconjug Chem. 2010 Oct 20;21(10):1788-93. Synthesis of the Cyanine 7 labeled neutrophil-specific agents for noninvasive near infrared fluorescence imaging. Xiao L, Zhang Y, Liu Z, Yang M, Pu L, Pan D. Bioorg Med Chem Lett. 2010 Jun 15;20(12):3515-7. Epub 2010 May 18. A novel neutrophil-specific PET imaging agent: cFLFLFK-PEG-64Cu. Locke LW, Chordia MD, Zhang Y, Kundu B, Kennedy D, Landseadel J, Xiao L, Fairchild KD, Berr SS, Linden J, Pan D. J Nucl Med. 2009 May;50(5):790-7. Epub 2009 Apr 16. Synthesis of novel neutrophil-specific imaging agents for Positron Emission Tomography (PET) imaging. Zhang Y, Kundu B, Fairchild KD, Locke L, Berr SS, Linden J, Pan D. Bioorg Med Chem Lett. 2007 Dec 15;17(24):6876-8. Epub 2007 Oct 12. Non-invasive imaging of firefly luciferase reporter gene expression using bioluminescence imaging in human prostate cancer models. Li H, Li JZ, Helm GA, Pan D. Biotechnol Appl Biochem. 2007 Apr;46(Pt 4):179-84. Synthesis of a technetium-99m labeled tricyclic ganciclovir analog for non-invasive reporter gene expression imaging. Zhang Y, Lin J, Pan D. Bioorg Med Chem Lett. 2007 Feb 1;17(3):741-4. Epub 2006 Oct 28.